Test scores of Minnesota elementary through high school students seem stuck at the same place they were last year. And there was little improvement in the achievement gap between students of color and white students, according to data released Tuesday from the Minnesota Department of Education. Still, state education officials hope steady growth in math, reading and science scores over the last several years will help all students in the future. The Minnesota Comprehensive Assessment scores are made public at the department's website here. Compared to the year before, student test scores stayed fairly steady. Take the math MCA for 3rd through 8th graders, for instance. The number of white, Asian, American Indian and Hispanic students considered proficient in math increased by 1 percent. The number stayed the same for black students. But go back four years, and all students have seen a 5, 6 and even 7 percent increase in their proficiency rates. "Steady improvement is exactly what we're looking for," said Brenda Cassellius, Minnesota's education department commisioner. She maintains it's the longer term trends that matter when it comes to MCA scores. "You take 2, 3 percent each year in an entire state, and moving an entire system, within a decade you've seen a 20 percent increase," she said. But even if those modest gains continue, there's still a difference in proficiency rates between white students and students of color. For example, in the latest MCA scores, 67 percent of white students in Minnesota are considered proficient in reading while only a third of African-American students hit that benchmark. Similar gaps exist in math and science. St. Paul students show an even deeper divide. According to the latest MCA results, 73 percent of white students tested proficient in reading, 48 percentage points higher than black students. St. Paul Public Schools' Chief Academic Officer Christine Osorio says district officials want that to change. "We're very concerned about our achievement gap. I'll be honest we're working really hard to double down on our efforts around early interventions and greater professional development for teachers," she said. 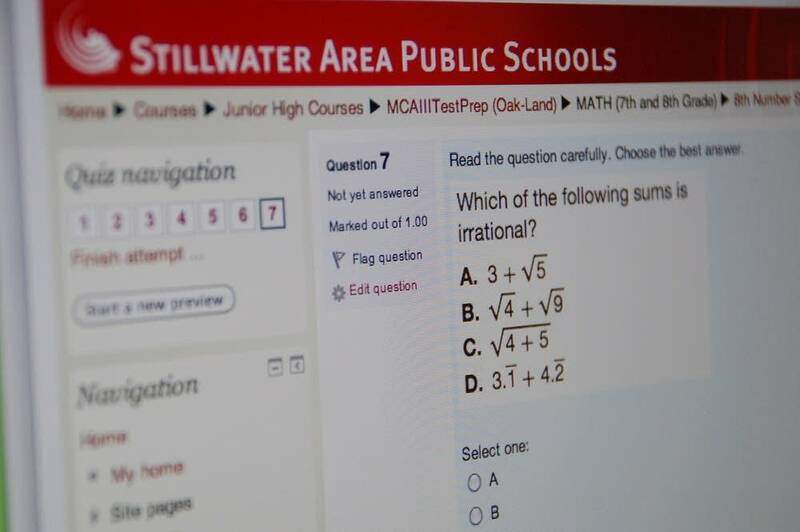 The district is looking to St. Paul schools like Open World Learning and Galtier Community School that saw improvements in student tests scores to see if they could serve as models for other schools. And district officials hope a plan to give every one of St. Paul's nearly 38,000 students an iPad in the next two years will allow the district to tailor school work for individual students. Just how it will work is being developed now, but the basic idea is for advanced students to use the iPads to work ahead at their own speed, while struggling students can spend more time mastering the basics. In Minneapolis, Johnson isn't happy with the test score divide either. A little less than three quarters of white students reached reading benchmarks, 3 percent higher than the year before. African-American students increased their proficiency rate too, but by 1 percent. About one in five black students is considered proficient in reading in Minneapolis. "After you see results like this over and over again, you can do one of two things. You can throw in the towel and throw your hands up and say 'I don't know nothing about this work.' Or you just get fired up and say 'We can do this.'." Johnson does see some positive news in the latest round of MCA scores. A handful of Minneapolis schools increased math and reading scores by double digits over the previous year. She wants to borrow some of the approaches taken at schools like Pillsbury Elementary and Edison and Roosevelt High Schools and model them across the entire district. The head of the state teachers union Education Minnesota, Denis Specht, doesn't like all the attention paid to MCA test results. She says Minnesota students spend too much time preparing for, and taking, the MCAs. And Specht says the release of last school year's test scores right before a new school year, doesn't help teachers. "When MCA test data is given to us this time of the year, it's really worthless," Specht said. The Department of Education says teachers will get more timely information from MCA tests starting this year, when all tests are put online. Teachers will get instant feedback on how students are doing as soon as they take the tests, instead of waiting four or five months for the results. Minnesota education officials will learn more about the performance of the state's schools this fall. That's when the Multiple Measurement Ratings come out ranking the state's schools based on MCA scores, individual student growth, graduation rates and achievement gaps.